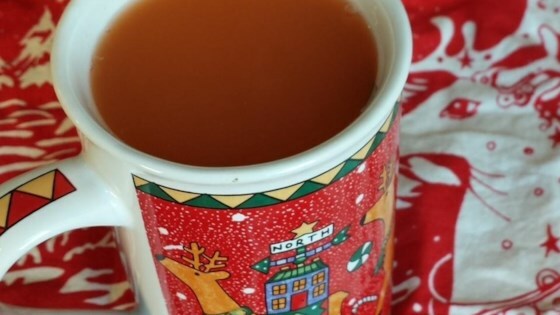 "An easy recipe for the traditional holiday drink. If you don't have a tea ball, place spice mixture on a small piece of cheesecloth and tie with a string, forming a small pouch." Mix apple cider, orange juice, lemon juice, pineapple juice, and sugar together in a large pot over medium-low heat. Place cloves and cinnamon in a tea ball; add ball to the apple cider mixture. Simmer mixture until warmed through, about 15 minutes. Serve from pot with large ladle. Make your own ’shine! It tastes remarkably like apple pie. This recipe is always a family favorite for the holidays. I usually make a kid friendly batch, then one for the adults with rum added. Every year I'm asked to make this. I'd say its a hit. Good recipe but too sweet as written. I eliminated the sugar and it was perfect. Every guest loved it. I added whole allspice for added flavor.